LAS VEGAS, April 10, 2019 /PRNewswire/ -- The Howard Hughes Corporation® (NYSE: HHC) unveiled Las Vegas Ballpark®, Southern Nevada's newest professional sports venue, at yesterday's 2019 season opener of the Las Vegas Aviators® to a sold-out crowd of 10,000 fans. The Las Vegas Aviators, wholly owned by The Howard Hughes Corporation, is the city's oldest professional sports team and a member of the Pacific Coast League (PCL) as well as affiliate of the Oakland Athletics. Formerly known as the Las Vegas 51s, the team played its first game as the Aviators last night, marking the start of its 37th season in Las Vegas. The evening not only included a thrilling win by the Aviators over the Sacramento River Cats, but also unveiled the highly anticipated Las Vegas Ballpark for excited fans who experienced the Ballpark for the first time. "Las Vegas Ballpark is yet another sign of the city's continuing evolution as a major sports destination," said Nevada Governor Steve Sisolak. "Without a doubt, this is the finest Triple-A stadium in the country, providing a major league venue for the city's beloved minor league team. Built in just over a year, Las Vegas Ballpark is proof of southern Nevada's can-do attitude." "Tonight's opening game is a milestone moment—for the Las Vegas Ballpark, for Downtown Summerlin®, and for the fans throughout the entire region," said David R. Weinreb, CEO of The Howard Hughes Corporation. "The Aviators new name is an homage to Howard Hughes and his passion for flight. He had an outsized impact on Las Vegas and we have made sure to bring his spirit of innovation into every aspect of the Ballpark experience—from our new mascot and uniforms to the design of the stadium, plus the largest LED video screen in all of Minor League Baseball. Tonight also marks a dynamic new chapter for the community of Summerlin and its thriving downtown, which continues to grow as a vibrant destination for visitors throughout Nevada, and beyond." The season opener included a first pitch from Hailey Dawson, a celebrated local nine-year-old with a 3-D printed robotic hand created by the UNLV Howard Hughes School of Engineering and the first person to throw the first pitch in all 30 MLB stadiums nationwide. 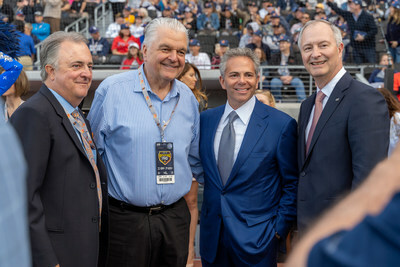 In addition to Weinreb, Dawson was accompanied to the mound by Nevada Governor Steve Sisolak and CEO of the Las Vegas Convention and Visitors Authority Steve Hill. The night was also highlighted by a flyover from the United States Air Force Aggressors; the 64th Aggressor Squadron flying in F-16 Fighting Falcons from Nellis Air Force Base. 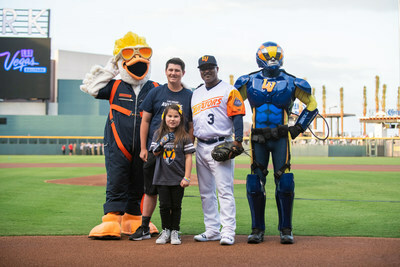 In addition to the Las Vegas Aviators' new logo and team uniforms, fans were introduced to the team's two new mascots for the first time: Spruce, a goose that lives in the outfield swimming pool at Las Vegas Ballpark; and Aviator, a larger than life "super hero" and ex-pilot. Both mascots embody the team's aviation theme and reflect the great passion for aviation that, along with an unparalleled vision of innovation, defines the legacy of Howard R. Hughes, Jr., namesake of The Howard Hughes Corporation. Las Vegas Ballpark encompasses four levels: field, concourse, club/suite and press. It features approximately 8,200 fixed seats and boasts a total capacity of 10,000. The stadium includes 22 suites, 400 club-level seats and 350 party deck seats. The Las Vegas Aviators are the first team in sports history with a home ballpark featuring 4Topps Premium Seating's innovative, breathable AirFlow Mesh seats throughout the stadium. Food and beverage plays a significant role in the new Ballpark experience, with better basics offered from old-school nachos and the Hungry Hotshot kids value meal to the Streamline hotdog and a refreshing 16oz domestic beer—each one under $10.00. Las Vegas Ballpark also offers elevated classics and expanded options to delight the whole family. Created by Las Vegas-based restaurateur and official Hospitality Experience Curator for Las Vegas Ballpark, Sarah Camarota, and overseen and operated by industry-leading Triple-A ballpark concessionaire, Professional Sports Catering, offerings include the FLYDOG collection of specialty hot dogs by Las Vegas celebrity chef Brian Howard of Sparrow + Wolf; a custom handcrafted beer called Aviator Ale by popular local brewery, Tenaya Creek; stadium-wide Frosé and customized menus for Club-suite guests by celebrity chef Giada De Laurentiis; and the unique culinary fusion of BBQ Mexicana by Chef/Owners Susan Feniger and Mary Sue Miliken. Las Vegas Ballpark even has its own resident mixologist, Tony Abou-Gamin, who has developed a full menu of custom signature cocktails made with only the freshest ingredients. Located on 7.65 acres just south of City National Arena, practice facility of the National Hockey League's Vegas Golden Knights, Las Vegas Ballpark is the second major sports facility to open in Downtown Summerlin, the urban core of the Summerlin® master planned community on the western edge of the Las Vegas valley. The Ballpark was designed by HOK, a national architecture firm with more than 40 major sports stadiums and arenas to its credit. Las Vegas Ballpark's contractor is Hunt/Penta, who built the stadium in slightly over one year following its February 2018 groundbreaking. According to Kevin T. Orrock, President, Summerlin, what is happening in Downtown Summerlin on a micro-level is reflective of what is happening in Las Vegas on a broader scale. "Las Vegas has become a sports town in relatively short order," said Orrock. "With the opening of Las Vegas Ballpark, Downtown Summerlin is now home to not just one, but two major sports venues. Professional hockey and baseball are converging at Downtown Summerlin in a spectacular way to create a true sports entertainment destination for the entire valley." "This day was long coming and a true celebration for our entire community," said Don Logan, President and Chief Operating Officer, Las Vegas Aviators, who has been with the team since 1984. "With a new name, a new Ballpark and a new affiliation, the Las Vegas Aviators are launching an exciting new chapter in franchise history. Thanks to this beautiful new facility that delivers a top-notch experience, we expect to significantly grow our fan base. We have enjoyed more than three decades in Las Vegas and look forward to many more as Las Vegas' hometown team." According to Steve Hill, CEO and president of the Las Vegas Convention and Visitors Authority (LVCVA), Las Vegas Ballpark is a community asset that will also host other sports and community events year-round. "The Ballpark was designed with flexibility in mind to ensure it can easily host a variety of events and gatherings," he said. "Las Vegas Ballpark joins a growing list of sports venues and facilities including City National Arena and Las Vegas Stadium, the future home of the Raiders, that are elevating the city's profile as a sports destination for locals and tourists alike. It's an exciting time in our city's history." Las Vegas Ballpark, located on eight acres in Downtown Summerlin just south of City National Arena – practice facility for the Vegas Golden Knights, is the home of the Las Vegas Aviators, the city's professional Triple-A baseball team of the Pacific Coast League (PCL) and affiliate of the Oakland Athletics. Las Vegas Ballpark provides a wide range of seating options including 22 suites, club seats, berm seating, party zones and decks, picnic tables, kids' zone, bars and a pool beyond the outfield wall. Designed to host a variety of events in addition to baseball, the site is landscaped to complement the surrounding master planned community. The site is easily accessed from all regions of the valley via the 215 Beltway. Developed by The Howard Hughes Corporation, Summerlin began to take shape in 1990 and has ranked in the country's top 10 best-selling master-planned communities for nearly two decades. Located along the western rim of the Las Vegas valley, Summerlin encompasses 22,500 acres with approximately 6,000 gross acres still remaining to accommodate future growth, including infrastructure, open space and common areas, all within the master plan. The community is currently home to more than 100,000 residents who enjoy an unparalleled list of amenities. These include more than 250 neighborhood and village parks, more than 150 completed miles of trails, 27 public and private schools, 14 houses of worship, ten golf courses, shopping centers, medical and cultural facilities, business parks and dozens of actively selling floor plans. Homes are available in a variety of styles – from single-family homes to townhomes– priced from the $300,000s to more than $2.5 million. For information on custom homesites in The Ridges please call 702.255.2500. Luxury apartment homes offer monthly rents starting from the $900s. Visit www.summerlin.com for more information.